Being a fan of Orson Scott Card I have read many of his books. So how did I miss this one? Or the fact that it is a series? The only reason I even knew about it was because of the movie coming out later on this year. I loved this book and was shocked at the end. Who would have guess? But I kept wondering. Card takes a young child and puts him in adult situations making serious decisions. Very thought-provoking and intense scenes with bullies and fights. Children are so innocent and usually make decisions based on what they have seen other children do. Ender Wiggins was a genius and did things that some adults would never even thought of doing. I was glad in the end when Ender was able to reconnect with his sister. It would have been a sad life if not. Now I can’t wait to read the next books in the series. Card has a way with words giving them a deeper meaning. Philosophy classes or even theorists could spend years psychoanalyzing his work. Does anyone have a favorite Orson Scott Card novel? The “Songcatcher” is a beautiful story about historical culture that changes a woman. Sweeping views of the mountains brings to mind the Ozarks in Missouri. The mountain people have artists of all kinds; basket weavers, painters that capture the scenery, and musicians. 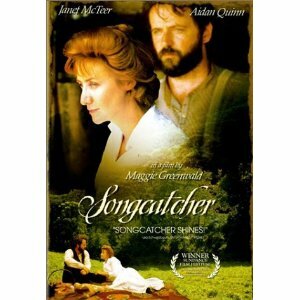 The “Songcatcher” is an independent movie. Written and directed by Maggie Greenwald. With actors Janet McTeer who plays Dr. Lily Penleric, and Aidan Quinn who plays Tom. In her first appearing role in a movie is Emmy Rossum who plays the part of Deladis, the assistant to Dr. Penleric. The genre is a drama and sentimental movie. The time era is early 1900’s and the setting is the Appalachian mountains. The beginning starts with Dr. Penleric who is an assisting professor at a university teaching music to students. She is a musicologist and is very passionate about her work. She is under paid and wants to become a full time professor but the board does not want a woman professor. Quitting she leaves to visit her sister in the Appalachian mountains. Lily’s sister is a teacher at a small school there in the mountains, along with her partner. There she discovers that the mountain folk have the original English-Scottish ballads that she has been studying. Lily employs Deladis to sing for her so she can record the music. Dr. Lily Penleric travels around the mountains lugging her huge gramophone and recording from different folk the ballads they sing. Lily believes that this true form of music should be recorded and shared like a great archeology find. Lily meets Tom who is a hardened mountain man that came back “from the other world” to be a talented musician. He doesn’t want her stealing their music just to have her book published but Lily says she is willing to pay them. Soon after he warms up to her and sees that she is helping the mountain people feel proud of their traditions and culture. They see that their artwork and music is more than entertainment but a legacy that should be recorded for others to hear and see. When Dr. Penleric receives a letter from a colleague from the university saying that she will be Whittle’s assistant in the research, she becomes upset. Lily had worked hard for all the music she had gathered from the people. She learned to love their cultures and understood them. She saw how hard they work to live on the mountains. They suffer with starvation, no medical doctors to help with illnesses or the birth of babies, and poor education. Plus they have business men coming knocking on their doors wanting them to sell their land so they can modernize the mountains. The business men want the untapped coal mines to fund the progress of towns and schools to be built there. The climax of the movie stems from hatred, discrimination, adulteress, and misunderstandings. The school is burned to the ground along with their house next to it. Lily’s work is destroyed. Rather than start over and collect the music again for the book Lily decides to leave the mountains. Dr. Penleric wants to start a new adventure and she must convince Tom to leave his home in the mountains to be with her in the city. Beautiful songs abound in the movie along with the breathtaking scenery. The mountains are a wonderful place to live, and the people there have a way of life, with folk music at the heart of it. Four stars for this movie.